A visit to Chicago, as to most big cities, can be expensive. Downtown hotels don’t come cheap and dining in the city’s best restaurants can cost a pretty penny. Add in cab fares, museum fees, and tour prices, and you may think a visit to the Windy City is out of your budget. The good news is that not only are flights to Chicago fairly affordable from most other cities, but there’s also a ton of free and very cheap things to do to help you experience the best of the city on a smaller budget. Here are five ways to enjoy Chicago without paying a single cent. Chicago’s beaches – particularly Oak Street Beach and North Avenue Beach – become the center of the social universe on hot summer days. Families come to play in the sand and surf, while young singles come to work on their tans and mix and mingle under the sun. 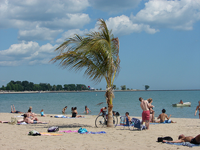 Admission to most of Chicago’s 15 swimming beaches is free, as is access to the Lakefront Path, a route that winds its way north from downtown and is packed with bikers, walkers, roller-bladers and runners in the summer. The Lincoln Park Zoo is one of the oldest zoos in the country. It’s also the country’s largest free zoo, home to over 1,200 animals. Come early to avoid the crowds (and the midday heat) and see giraffes, hippos, lions, tigers, seals, zebras, penguins, polar bears, and many more. If you come on a Wednesday or Saturday, be sure to swing by the Green City Market, also located in Lincoln Park. You can shop for artisanal breads, cheeses, pastries and treats, or just wander the stalls and snack on free samples. 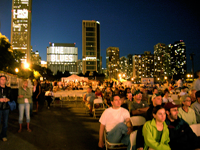 Chicago’s neighborhood festivals are one of the greatest joys of summer. It seems every weekend you can find another fest with live music, food and drink vendors, artists displays and crafts for sale. From food festivals and art shows to book fairs and cultural festivals, there’s something for everyone. And though you’ll need to spend money if you want to eat, drink or shop in the festival, the admission is often free or on a donation basis. 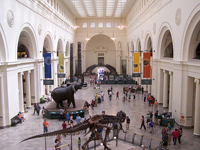 Throughout the year, many of Chicago’s museums schedule free admission days. The Art Museum is free every Thursday after 5pm, the Museum of Modern Art is free each Tuesday, The Field Museum is free the second Tuesday of every month and the Chicago History Museum is free every Monday. Many other, lesser-know museums offer free admission every day, so when you still want to satisfy your desire for culture but don’t want to bust your budget on admission fees, check out the free options. When it comes to sweeping vistas in Chicago, the two most famous options are the John Hancock Building and the Willis (formerly Sears) Tower. The latter has vertigo-inducing glass-bottomed ledges you can look down from, for a hefty fee. But at the former, you can skip the observation deck and head up to the Signature Lounge on the 96th floor. Drinks are pricey and you’ll need to order one to sit down, but for the same price you’d pay just for the view, you get to enjoy a drink too.